Sony präsentiert auf dem Mobile World Congress sein neues Smartphone-Flagschiff Xperia Z2. Im spritzwassergeschützten Gehäuse mit 5.2 Zoll-Display befindet sich eine 20.7 Megapixel-Kamera, die auch für Ultra HD-Aufnahmen mit 3840 x 2160 Pixeln und 30 Bildern pro Sekunde geeignet ist. Zur Reduzierung von Bildruckeln ist ein Bildstabilisator eingebaut und als optionales Zubehör gibt es auch ein externes Stereo-Mikrofon. Genügend Leistung soll die 2.3 GHz-Quad Core-CPU von Qualcomm bringen und als Betriebssystem ist Android 4.4 vorinstalliert. Sony plant den Verkaufsstart des Xperia Z2 für den März. 24th February 2014, MWC, Barcelona – Sony Mobile Communications (“Sony Mobile”) today introduces Xperia™ Z2, Sony’s best ever premium waterproof smartphone combining its best display, sound, camera and camcorder experience as well as an exclusive entertainment offer and a growing ecosystem of companion products. 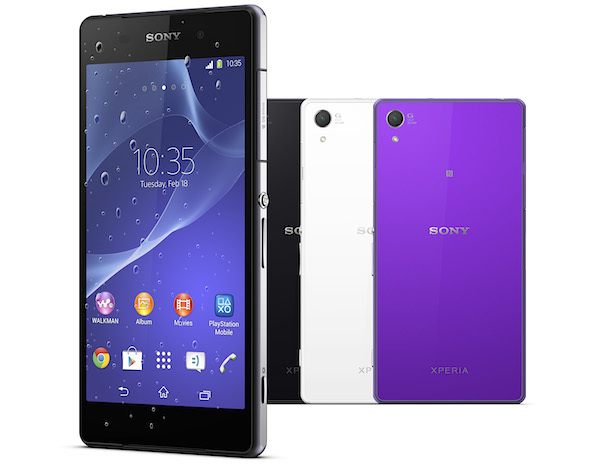 Xperia Z2 is the newest addition to Sony’s premium Z series and will launch globally from March 2014. Capture and relive every detail with Xperia Z2’s camera and camcorder. Xperia Z2 features Sony’s proven camera technologies to deliver the unbeatable combination of the world’s best mobile camera and our most advanced camcorder ever in and 8.2 mm slim smartphone. The 20.7 megapixel camera is matched with 1/2.3-type Exmor RS for mobile CMOS image sensor, Sony’s award-winning G Lens and intelligent BIONZ™ for mobile image processing engine resulting in superb photo and video quality. These features work together to bring you sharp, vivid and beautiful photos and videos no matter what the circumstances. With new enhanced video mode, you can now capture memories in stunning detail in 4K resolution (3840×2160 pixels/30p) at four times the detail of Full HD, delivering the world’s best camera and camcorder in a waterproof smartphone1. Plus, SteadyShot™ image stabilisation technology ensures your footage will stay smooth even if you are walking. The new Movie Creator allows you to trim and crop your videos so that you can easily pick out what you want to share. Insert dramatic slowdown effects at one or more places on the timeline of the video, then preview the results before you save and share your video. The best video deserves the best sound. The compact and innovative STM10 Stereo Microphone offers high quality stereo audio recording. Compact and easy to carry, it’s the perfect match for Xperia Z2’s 4K video recording. Enhance your mobile experience with a growing range of innovative Xperia camera apps. In addition to Info-eye™, Social live and Timeshift burst, Xperia Z2 also comes pre-loaded with new Xperia camera apps for both photo and video. Timeshift video: To relive every moment of the action in slow motion detail, the new Timeshift video mode lets you shoot in 120 frames per second and select scenes to slow the playback speed for dramatic slow motion effects exactly where you want, even underwater. Creative effect: Use a range of new creative effects for your photos and videos. Available in real-time for video, these adjustments enhance your clips with a range of effects such as colours, image trails, mirror and motion effects. Background defocus: This new camera app simulates a shallow depth of field. Capture two photos at different focus settings and blend together the different depths, leading to a blurred out background for more professional looking photos. AR effect: Now available for video recording, have some fun with your photos and videos with new augmented reality animations, including sound effects for video. Vine4: Create short, beautiful, looping videos in a simple and fun way for your friends and family to see – all from your camera’s viewfinder. Plus, using the dedicated camera button, you can capture Vine videos underwater as well. In addition to these fun and useful pre-loaded Xperia camera applications, there’s a whole range of extra apps for you to enjoy including Wikitude Places, Evernote, VI Sports and more. Simply go into your camera viewfinder, tap the camera mode icon and then click on ‘+Apps’ to see all the latest apps available on Sony Select to enhance your smartphone experience. The Xperia Z2 Android smartphone is designed with the user in mind, drawing on Sony’s expertise in premium craftsmanship. Evolving Sony’s stunning OmniBalance design, Xperia Z2 has a slimmer and more comfortable feel by having the glass panels encased in a single, solid aluminium frame with smoother edges. This dust-resistant and waterproof (IP55 & IP58) powerhouse blends beauty with function. The dedicated camera button means that you’re ready to capture the action wherever you are – both in and out of the water. Plus, the stunning 5.2” display, balanced with symmetry in design, provides a natural feel when held in your hand. To enjoy the latest content in stunning quality and vivid colour, Xperia Z2’s screen is built using the latest BRAVIA® TV technologies optimised for mobile. The 5.2” Full HD TRILUMINOS™ display for mobile with Live Colour LED provides the widest palate of rich natural colours for the sharpest images and a viewing experience that is as close to reality as possible. Natural colours true to life can be difficult to reproduce on a display. TRILUMINOSTM Display for mobile with brand new Live Colour LED uses red & green phosphor with blue LEDs and customised colour filters to produce a brighter and more uniform light. The result is richer colours on the screen for all of your smartphone viewing without the risk of saturation. Sony’s intelligent super resolution technology, X-Reality for mobile, analyses each image to optimise colours, sharpness and contrast while also reducing noise. The super resolution function reproduces lacking pixels for spectacular clarity and detail. To enjoy with the best display and a wide range of entertainment, Xperia Z2 also offers amazing sound quality with stereo speaker output and Sony’s digital noise cancelling technology. Whether you’re on a plane or in on the bus, enjoy music on the go without the interruption of background noise. Our digital noise cancelling technology and dynamic sound in Xperia Z2 helps reduce up to 98% of ambient noise, when used with the compact in-ear MDR NC31EM Digital Noise Cancelling Headset. Or, immerse yourself in entertainment with S-Force Front Surround™ to enjoy the latest movies, gaming and music on your Xperia Z2. With Xperia Z2, you also get a range of entertainment right from the moment you turn your smartphone on. Xperia Z2 owners will have access to an exclusive content offer that includes six blockbuster movies from Sony Pictures, including Captain Phillips, through the Video Unlimited service as well as 30 days free trial of the Music Unlimited3 service and a range of PlayStation®Mobile games. “What’s New” app helps you discover new and recommended movies, music, games and apps for enjoyment on your Xperia Z2 – all accessible from an informative and interactive widget on the home screen. “WALKMAN®” and Movies applications provide access to a global catalogue of more than 25 million songs on the “WALKMAN®” app through the Music Unlimited4 service and tens of thousands of movies and TV series on the Movies app through the Video Unlimited5 service from Sony Entertainment Network. PlayStation® App gives you the chance to enjoy an enhanced gaming experience – keeping you connected to your gaming friends and the games you love to play. PlayMemories Online5 – a cloud-based image and video service that is integrated into the Album application. A new ‘All Sync’ feature enables users to instantly auto-upload all of their photos without storage limitation5 to enjoy on all your devices. TrackIDTM TV6- enhances your TV-viewing experience as it lets you search, share and explore information from broadcasted TV shows such as cast & crew, biographies, filmography or show related Tweets. Xperia Z2 is armed with the power to multi-task and enjoy everything from super-fast web surfing to video streaming without the wait. With the fully integrated Qualcomm® Snapdragon™ 801 processor with 2.3 GHz quad-core Krait CPUs and 4G LTE, Xperia Z2 offers ultra-fast performance for the apps and entertainment you want to enjoy, without the interruptions. The Snapdragon 801 also features the Adreno™ 330 GPU for rich graphics and gaming and a dual ISP for a seamless camera, camcorder and display experience. Xperia Z2 also includes a large 3200 mAh battery which provides outstanding, class-leading battery performance. Plus, with Sony’s Battery STAMINA Mode, you can stay connected even longer, as it automatically turns off the functions you don’t need to save power when your display is inactive. As soon as you press the power button to wake up your screen, everything is up and running again. Sony offers the most comprehensive range of innovative companion products and accessories to give you new ways to use and enjoy your smartphone. With 154 NFC enabled one-touch connected products – including TVs, headphones, audio speakers, tablets, and more – it has never been easier to connect and enjoy your content across multiple devices. The SmartBand SWR10 works with Xperia Z2 to log your life in partnership with the Lifelog application, creating an automatic 24/7 diary of your activities, entertainment and memories. Plus, with SmartBand you’ll never need to worry about losing your phone or missing a call with a series of customisable smart notifications delivered straight to your wrist. The Xperia Z2 will launch globally from March 2014.